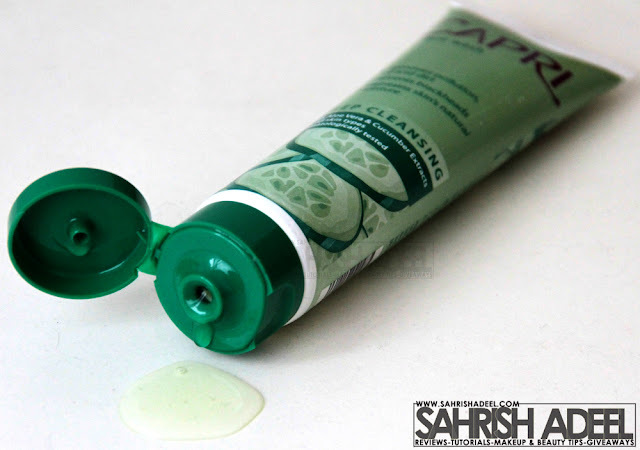 Capri Deep Cleansing Facewash - Review! | Sahrish Adeel - Malaysia based Pakistani Beauty & Lifestyle Blogger! Capri has been known for its best beauty soaps and this time they introduced their first ever Capri Deep Cleansing Facewash. Contains Aloe Vera & Cucumber Extracts. Excellent ingredients for healthy skin. Makes good amount of leather. Gives a squeaky feel after wash.
Removes dirt, oil and even makeup easily. Small quantity is sufficient for one time. Not suitable for oily skin. Oil starts to come back after like 30 minutes or so. Tube packaging is not for a person who does not like mess. Product spills up while opening it. I have used this face wash for over a month. I have a very oily skin and I live in a humid weather. As compared to other face washes I used (Neutrogena/Clean & Clear), I have to wash my face while using this face wash for about 3-4 times a day or the oil comes back. It might be suitable to people with dry to normal skin. 50 ml tube for PKR 80 and 100 ml tube for PKR 145. So if I compare the price with Neutrogena/Clean & Clear, it is rather economical. 100 ml tube will atleast last for a month and more. I hope you have liked this review. Which face wash do you use for your skin type? Disclaimer: PR sample sent for review purpose. My opinions are however 100% honest like always.